MISSION EXTENDED. The flight of space shuttle Discovery will take advantage of the available consumables and stay docked to the International Space Station for an additional day, allowing the astronauts to help the Expedition crew with internal work inside the Permanent Multipurpose Module. So the mission now becomes a 12-day flight with landing next Tuesday, March 8 at about 11:30 a.m. EST at the Kennedy Space Center. This was the 154th spacewalk devoted to station assembly and maintenance since construction began in 1998. U.S., Russian, European, Japanese and Canadian astronauts have logged 967 hours and 39 minutes of EVA time. This was the sixth EVA in the career of Steve Bowen and first for Al Drew. Bowen has accumulated 41 hours and 4 minutes of spacewalking time in his previous excursions on separate spaceflights in 2008 and 2010. EVA ENDS. Repressurization of the Quest airlock module began at 5:20 p.m. EST, marking the official end of today's spacewalk by Steve Bowen and Al Drew. The EVA lasted 6 hours and 34 minutes. The mission's second of two spacewalks is planned for Wednesday starting around 10:15 a.m. EST when Bowen and Drew head outside for a variety of maintenance tasks around the International Space Station. And with that, the astronauts are climbing into the airlock to finish this successful outing that accomplished absolutely everything written into the plan. Al Drew just opened a metal container to "fill" it with the vacuum of space. The cylinder will be returned to Earth and placed on public display by the Japanese Aerospace Exploration Agency. The spacewalkers are en route back to the airlock. One final task on today's to-do list is Japan's "Message in a Bottle" public engagement effort. On their way out of the area, the spacewalkers retracted a couple of 'stops' on the tracks that had been in place to protect the mobile transporter and tether shuttle from going too far. The new rail stubs just installed further out take care of those stops. The second stub has been bolted in place. Basically the astronauts have just lengthened the International Space Station's railway for the driving the robotic arm's mobile base and crew equipment carts even further on the starboard trusses. The astronauts have installed the first of two rail stubs on the Starboard 3's tracks to enable the mobile transporter to go even farther outboard and thus give the robotic arm an extended reach. Since time permits, the astronauts are progressing to another "get-ahead" task to work on the station's railway tracks. Al and Steve removed the camera stanchion, put the wedge in place, then bolt the camera pole into the new orientation. They had been about 30 minutes behind the timeline before this task, but it went well and now they're just 5 minutes behind. The spacewalkers are placing a wedge under the external television camera's stanchion to cant the structure away from the newly installed Express Logistics Carrier No. 4. The camera and ELC are in very close proximity to each other on the Starboard 3 truss. Al has re-emerged from his brief stop at the airlock. Both spacewalkers are heading to the Starboard 3 truss to work on a television camera. Al is carrying that foot platform back to the airlock for bringing inside the station tonight. While at the airlock, he's going to take the opportunity to do a quick recharge of his spacesuit oxygen system in case today's spacewalk runs long. The robotic arm has maneuvered Steve to hop off. He'll be removing the foot platform he'd been standing on and stash it on ESP-2. Now passing the four-hour mark of today's spacewalk. The two big ticket items for this EVA -- installing the power extension cord and putting the failed pump module into a storage enclosure -- have been accomplished successfully. The remaining time on this excursion will be spent working on an external television camera and the station's rail tracks. The thermal door on the storage box has been closed, finishing today's spacewalking work on the pump module! Meanwhile, Al has headed to the Z1 truss atop the station to drop off a portable foot restraint, open insulation flaps over remote power control modules to enable the Dextre robot access for potential future need and reposition a tool stanchion. Later, he'll retrieve a different foot restraint that the astronauts will bring back inside the station tonight for some modification work to remove a heat shield. Steve is finishing with the other electrical plugs and putting dust caps on the exposed ports of the pump. Both spacewalkers have attached that handling fixture removed from the old pump onto the spare flex hose rotatory coupler that is stored on ESP-2. The vent tool was mated to the old pump and electrical connectors have been attached. And after six months of waiting outside the space station, the failed pump module has been stuffed inside the storage box to await eventual return to Earth for analysis. NASA is planning a ride home during the Atlantis mission this summer. The grapple bar has been detached, allowing the failed pump to fit into the storage box. Steve is engaging four bolts to affix the pump into place and will connect the venting tool that Al set up earlier today. During those lengthy spacewalks last August that the orbiting astronauts scrambled to pull off, the crew didn't have time to finish stowing the failed pump. It was temporary left hanging on the robotic arm's mobile transporter. Today's work finally moves the module to the open box on the External Stowage Platform No. 2 deck where the replacement pump was housed originally. The pump is partially installed. They must remove the handling fixture that was used in the replacement procedures before sliding the pump all the way in. Steve and Al are working together to get this device into the box. The container has guide rails and such. This failed pump was extracted from the International Space Station's Starboard 1 truss -- a girder that is part of the outpost's backbone structure. The coolant pump was original equipment launched within the truss on the STS-112 shuttle mission in October 2002 and then fully activated during STS-116 in December 2006. But it stopped working on July 31 and was replaced with a spare last August. Steve is rotating this 780-pound ammonia pump module into the correct orientation for inserting it into the External Stowage Platform No. 2. Steve has the old ammonia cooling pump in his hands as the robotic arm flies him away from the mobile railcar. Deposited on the mobile transporter's hand-like anchor on August 11, it was put there to get the pump out of the astronauts' way when they unwrapped and installed the replacement. The pump had been secured for the past half-year on the receptacle known as POA on the Canadian-made Mobile Base System. POA is the Payload Orbital replacement unit Accommodation. The other robotics workstation in Destiny is up and running now. And so the EVA operations can resume to maneuver the old pump. Al has gotten the venting equipment set up for use on Wednesday's spacewalk. He's now just waiting at ESP-2 to help guide the pump into the storage box. Here's another photo gallery showing shuttle Endeavour pulling into the Vehicle Assembly Building a little while ago. Robot arm operators Scott Kelly and Mike Barratt are moving from Cupola to Destiny, which is the faster option to overcome this workstation problem. Robotics are on hold for the moment due to a communications interruption to the workstation equipment in the Cupola. Mission Control says it'll take 30 minutes to reboot. The other option is moving down to the other robotic workstation over in the Destiny laboratory. The station's robotic arm is under the controls of Expedition 26 commander Scott Kelly and Discovery mission specialist Mike Barratt. They are swinging arm passenger Steve Bowen toward the failed pump module to grab it and hand-carry it down to the storage enclosure. The bags Al retrieved from the CETA cart contain the vent tools that will be used to expel the remaining 10 pounds of ammonia inside the failed pump. The actual venting will occur on the next spacewalk Wednesday. But he will get the equipment organized and deployed right now. Steve has set up the foot platform on the robot arm and ingressed it. The arm will maneuver the astronaut around to pick up the failed pump and insert the boxy item into the more-permanent storage locale. The pump being relocated into a protective enclosure on the External Stowage Platform No. 2 today experienced some sort of electrical short on July 31, knocking out half of the space station's thermal cooling system. It was replaced during a series of three spacewalks performed last August by the Expedition 24 resident crew using one of four spares prepositioned aboard the station. Steve and Al split up and have gone in separate directions now. Steve will be working with the space station's robotic arm to attach a foot platform for him to stand upon during the upcoming pump module relocation. Al is going to the port CETA cart on the station's rail tracks to retrieve a pair of tool bags left outside during last summer's pump replacement operations and bundle them with a portable foot restraint, then carrying that to the External Stowage Platform No. 2 where the failed pump is going to be mounted later today. The first objective of the spacewalk has been completed with the successful routing of the J612 extension cable outside the Unity node of the International Space Station. This task had to be completed before the Permanent Multipurpose Module can be installed on the Earth-facing docking port tomorrow. The PMM will cover up an external power outlet. So this 10-foot extension cord ensures the socket can be utilized in future if needed to power heaters in a contingency scenario with the Tranquility module. Installing this so-called J612 extension cable was planned last summer during the Expedition 24 spacewalks. But time ran out with spacesuit consumables on the final excursion by Doug Wheelock and Tracy Caldwell Dyson, so the job was deferred until now. 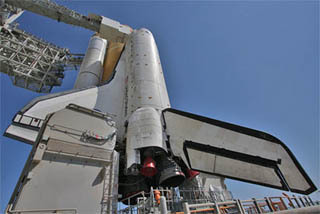 Down at the Kennedy Space Center, the shuttle Endeavour has arrived inside the Vehicle Assembly Building for attachment to the external fuel tank and solid rocket boosters for that ship's final launch on April 19. See our STS-134 status center for live updates. The spacewalkers are climbing along the bottom-side of the International Space Station to the worksite for today's first chore. They will be plugging in an extension cable to the Unity connecting node before the new Permanent Multipurpose Module gets mounted there tomorrow and makes this power socket inaccessible. The latest version of the NASA Television schedule (Rev. D) can be downloaded here. Both spacewalkers have emerged from the airlock. This is Steve's sixth EVA. He did three during the STS-126 shuttle flight to the station in 2008 and two last year during STS-132 for a total lasting 34 hours and 30 minutes of spacewalking time. Al is taking his very first spacewalk today. Mission Control has updated the official start time to 10:46 a.m., some 32 minutes early. The EVA got underway 31 minutes ahead of schedule. EVA BEGINS. The spacewalkers switched their suits to internal battery power at 10:47 a.m. EST, marking the official start time for today's EVA by Steve Bowen and Al Drew. This is the first of two spacewalks planned during Discovery's mission at the International Space Station. The depressurization has been completed and the Quest airlock's outer hatch leading to space is now open. Here's a photo gallery from this morning showing shuttle Endeavour leaving the processing hangar en route to the Vehicle Assembly Building for the ship's final launch in April. Steve Bowen and Al Drew have moved into the section of the airlock that will be depressurized shortly. And the inner hatch has been closed. Clad in their spacewalking suits, Steve Bowen and Al Drew are having their tool belts and other gear attached by the fellow crewmates inside the Quest module. EVA preps are running nearly 45 minutes ahead of schedule this morning. Astronauts Steve Bowen and Al Drew are suiting up for a planned six-and-a-half-hour spacewalk to install a backup power cable between two space station modules, move a failed ammonia pump to an insulated enclosure and to perform a variety of maintenance tasks outside the orbiting lab complex. They also plan to capture a sample of the vacuum of space for a Japanese educational project called "Message in a Bottle." Down at the Kennedy Space Center, the shuttle Endeavour is beginning to make this morning's milestone move from the Orbiter Processing Facility bay No. 2 to the adjacent Vehicle Assembly Building for the final time. See our STS-134 status center for live updates. The astronauts just woke up to begin Flight Day 5, which will feature a spacewalk outside the International Space Station to relocate a failed ammonia cooling pump into a better stowage location and some other maintenance chores. The EVA by Steve Bowen and Al Drew is scheduled to begin around 11:15 a.m. EST. The EVA preps for the day are complete and the spacewalkers are camping out overnight in the airlock. Wakeup time for Flight Day 5 is 6:23 a.m. EST. The Discovery astronauts worked through a busy day of robot arm activity Sunday, along with equipment transfers to the International Space Station and preparations for a spacewalk Monday by astronauts Al Drew and Stephen Bowen, the first of two planned for the shuttle's final mission. The joint crews are gathered for a procedure review of tomorrow's spacewalk activities. Steve Bowen and Al Drew will be heading outside the International Space Station at about 11:15 a.m. EST for the first of two EVAs on Discovery's mission. The six shuttle Discovery astronauts and members of the International Space Station's resident crew just completed live interviews with The Weather Channel, WBZ Radio of Boston, WSB TV of Atlanta and WTVT TV of Tampa Bay. And here's Flight Day 3 photos showing up-close views of Discovery during yesterday's backflip maneuver beneath the International Space Station. Check out these photo galleries from Flight Day 1 and Flight Day 2. The space station's robotic arm has gone down into Discovery's payload bay again, this time to remove the Orbiter Boom Sensor System. The station's arm is maneuvering the boom over to the shuttle's arm for a handoff. The shuttle's arm can't reach around the Harmony module to get it. The boom had to be relocated to ensure proper clearance when the PMM module is unberthed on Tuesday, and this morning was a good time to perform the task. The Discovery astronauts are working through a busy day of robot arm activity, equipment transfers to the International Space Station and making preparations for a spacewalk Monday by astronauts Al Drew and Stephen Bowen, the first of two planned for the shuttle's final mission. Analysis of Discovery's heat shield imagery shows that there's no worries or need for any closeup inspections during time set aside in the mission timeline on Tuesday. "Great news for ya. No focused inspection for Flight Day 6. That means we will replan Flight Day 6 per the way we had intended preflight, which is further outfit of the PMM and maybe a little transferring too," CAPCOM Steve Robinson radioed the crew a little while ago. "Outstanding news, Steve," commander Steve Lindsey replied. Flight Day 4's wakeup call has been delivered to the orbiting astronauts. Today will be spent preparing for tomorrow's spacewalk, removing the inspection boom from Discovery's payload bay to clear the way for unberthing the Permanent Mulitpurpose Module later in the mission and working on the transfer of items between the space shuttle and the station.